have a firm delivery date, but we expect to receive the new flashes in either late December or early January 2006. As soon as we thoroughly test the new flash and verify that everything works properly, it will be added to our web site. 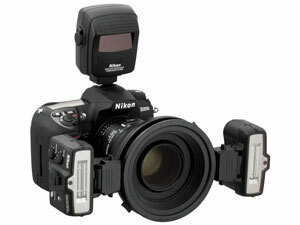 We are compiling a pre-order list for those interested in the new Nikon Macro Flash. Call us at 800-998-7765 and ask to be added to the list. We will contact you as soon as they are available and have been tested. creative potential for general multiple- flash photography, the new equipment was designed with the co-operation of specialist macro photographers from the wildlife and medical sectors. The SB-R200 is a new compact Speedlight for Remote Speedlight operation in two different shooting conditions. As part of a newly developed mini system for close-up flash photography, the SB-R200 is both lightweight and compact, which means it can be inserted into a dedicated ring attached to the lens to direct light onto small subjects. 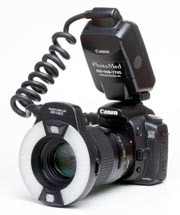 or a SB-800 Speedlight in Master mode. Additionally, Nikon D-SLRs with a Commander mode for the built-in Speedlight (D70s/D70/D200) can control SB-R200 units as well. of the balance of each unit’s output is simple to control through the comprehensive LCD panel. is the complete Nikon Close-up Speedlight Commander Kit SB-R1C1, consisting of the SU-800 commander, two SB-R200 units with attachment ring, lens adapters, filters and more. A less expensive option is the Nikon Close-Up Remote Kit SB-R1 that contains two SB-R200 units and necessary adaptor rings, filters etc. but without the SU-800. This is an attractive option for D70/D70s/D200 customers who can use their cameras’ built-in Speedlight in Commander mode to trigger the remote units. SJ-R200, Diffuser SW-12 and Flexible Arm Clip SW-C1. The SU-800 and SB-R200 units are also available separately to enable customers to expand their existing Creative Lighting System of SB-800 and SB-600 Speedlights. 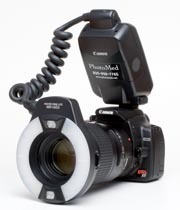 SB-R200 units with non i-TTL cameras such as the D1series /D100/ F5/F100. Through the end of the year, Canon is offering some generous rebates on their most popular D-SLR cameras. Included are the EOS 20D and the EOS Digital Rebel XT. When you combine Canon's 100mm macro lens and ring light with the Canon EOS 20D, you are eligible for a $270 rebate! The Rebel XT with the same lens and flash is eligible for $220! You can save even more if you purchase eligible recreational lenses at the same time. Call us at 800-998-7765 for more information and we can explain the Single - Double - Triple rules. PhotoMed's new Titanium Intraoral Mirrors are brighter and more scratch resistant than Chromium or Rhodium intraoral mirrors. Titanium reflects at a higher percentage than either Chromium or Rhodium which makes focusing easier when shooting occlusal and buccal mirror shots. 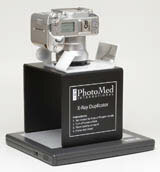 PhotoMed's new Xray Copy Stand makes photographing xrays a breeze. The Xray Copy Stand is designed to work with any of our compact digital cameras (Canon, Olympus and Epson) that have been sold over the past four years. Simply place the camera on the stand and you no longer need to focus. Simply frame and shoot. Includes stand and light box. For the first time in over 10 years, the prices of our intraoral mirrors are rising slightly. The standard mirrors will be increasing by $1 and the larger occlusal and handle mirrors will go up $2. The price increase will take effect in January. This is an excellent time to beat the increase and, through December, we will take 10% off orders of 3 or more mirrors and retractors. Mention code: DEC-10% to receive your 10% discount. Purchase any complete camera system during the month of December and receive two intraoral mirrors and a pair of retractors at no additional charge. Save $94. Mention code: DEC-MR to receive your free accessories.